LONG BEACH — A public hearing on a statewide policy for protecting sensitive eelgrass habitats in marinas and harbor areas from dredging and development projects was held in Long Beach June 26. Headed by the National Oceanic and Atmospheric Administration’s Fisheries Service, the draft policy is modeled after the current Southern California Eelgrass Mitigation Plan, but it would be enacted statewide and could result in more extensive eelgrass mitigation measures than the regional plan calls for. Eelgrass, a seagrass that thrives in the calm, shallow waters of marinas and harbors up and down California’s coast, has been designated as an Essential Fish Habitat (EFH) and a Habitat Area of Particular Concern (HAPC), leading the National Marine Fisheries Service to find ways to preserve and protect the plant from human interference. Currently, the Southern California Eelgrass Mitigation Plan (SCEMP) calls for a 1.2 to 1 ratio of eelgrass to be planted in place of damaged eelgrass following dredging or other projects. In other words, every square meter of eelgrass negatively impacted by a project would require 1.2 square meters of new eelgrass to be planted. But the draft California Eelgrass Mitigation Policy would call for varying mitigation ratios based on the plant’s past transplant success in a given area. In Northern California, where eelgrass transplant projects have been less successful, much larger eelgrass areas would have to be created if the plant is impacted, with the Northern California region having to mitigate nearly five times the amount of eelgrass removed or damaged. For Southern California, the 1.2 to 1 eelgrass replacement ratio would be increased to 1.38 to 1. The new number is based on studies over the past 25 years showing eelgrass mitigation efforts to have a failure rate (to establish a successful eelgrass habitat) of 13 percent. The new 1.38 to 1 ratio is aimed to meet the 1.2 to 1 ratio goal originally assigned in the Southern California plan. While most public comment on the topic noted the importance of maintaining eelgrass habitats, some spoke out about the hardships the plan puts on existing marinas and private dock owners. Long Beach Marine Bureau manager Mark Sandoval spoke out as chairman of the California Association of Harbormasters and Port Captains, saying that the eelgrass mitigation measures are flying in direct conflict with development of existing marinas. Sandoval has been heading up the $98 million redevelopment plan for Alamitos Bay currently in progress, and in the process, created a 10,000-square-foot eelgrass mitigation bank to offset any eelgrass damage that occurred during dredging and dock reconstruction. The eelgrass bank cost $1.7 million to build. “We’re talking about areas that were initially marked for use as a marina, but over the years, the area has silted up, and eelgrass formed around some of the docks,” Sandoval said. When he went to California Department of Fish and Game representatives to ask for advice on how to avoid eelgrass mitigation in the future, he said he was told to dredge more often, in order to keep the sediment level below depths where eelgrass can thrive. “Dredging is regarded as an intrusive practice, and it just seems counterintuitive to dredge more often to keep eelgrass out of harbors,” Sandoval said. NOAA Fisheries Service habitat coordinator Bryant Chesney noted that while no exemptions are currently planned for existing harbors, individual plans focusing on a specific harbor or marina can be crafted to create a set of policies that better suits that particular harbor. In Newport Beach, Harbor Resources manager Chris Miller has been working for years on just that — a plan the city hopes will be used as an alternative approach to the statewide mitigation plan. With Newport Beach’s mix of public and private marinas, mooring areas, docks and waterways, homeowners with docks extending into Newport Harbor are responsible to dredge around and under their dock area, while much of the navigable waterways are the responsibility of the federal government. Under the Fisheries Services’ proposed statewide policy, eelgrass mitigation for individual dock owners would be time consuming and costly. But the Newport Harbor-specific plan would work off a “threshold” plan that would identify a certain amount of eelgrass along Newport Harbor’s shoreline and dock area that would be deemed healthy or acceptable for the harbor. Once a healthy or sustainable amount of eelgrass has been identified for the harbor, dredging and dock replacement activities could occur without mitigation measures, as long as the “threshold” level was not lowered. 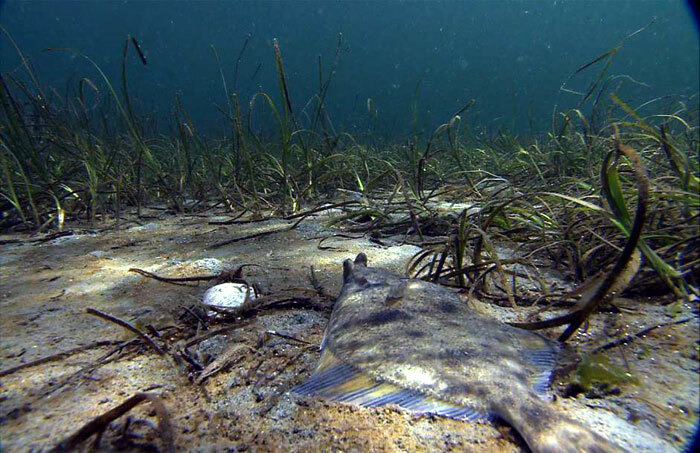 So far, the Newport Harbor-specific eelgrass plan has conceptual approval from the National Marine Fisheries Service and the State Water Resources Control Board. Before it gets implemented, the plan must be approved by the California Coastal Commission. Miller said he is now in talks with the commission. According to the draft California Eelgrass Mitigation Policy, four regions along California’s coast have been designated for different mitigation measures, and all have the goal or reaching the 1.2 to 1 ratio originally set forth by the Southern California plan. 1. Southern California (Mexico border to Pt. Conception): A ratio of 1.38 to 1 (transplant area to impact area) shall apply to counter the regional failure risk. That is, for each square meter impacted, 1.38 square meters of new suitable habitat, vegetated with eelgrass, shall be planted in suitable conditions to support eelgrass with a comparable bottom coverage and eelgrass density as impacted beds. Notwithstanding this initial minimum transplant ratio, a total of 1.2 square meters of new eelgrass bed habitat must be established for every square meter of eelgrass impacted. 2. Central California (Point Conception to mouth of San Francisco Bay): A ratio of 1.20 to 1 (transplant area to impact area) shall apply based on a zero percent failure rate over the past 25 years (four transplant actions). Again, the success ratio for mitigation in Central California is 1.2 square meters of comparable new eelgrass bed habitat that shall be successfully established for every square meter of eelgrass bed impacted. 3. San Francisco Bay (including south, central, San Pablo and Suisun Bays): A ratio of 3.01 to 1 (transplant area to impact area) shall apply based on a 60 percent failure rate over the past 25 years (10 transplant actions). That is, for each square meter adversely impacted, 3.01 square meters of comparable new eelgrass shall be planted into suitable conditions identified or developed to support eelgrass. A total of 1.2 square meters of new eelgrass bed habitat shall be successfully established for every square meter of eelgrass impacted. 4. Northern California (mouth of San Francisco Bay to Oregon border): A ratio of 4.82 to 1 (transplant area to impact area) shall apply based on a 75 percent failure rate over the past 25 years (four transplant actions). That is, for each square meter of eelgrass bed adversely impacted, 4.82 square meters of comparable new eelgrass bed shall be planted in suitable conditions to support eelgrass mitigation. A total of 1.2 square meters of new eelgrass bed habitat shall be successfully established for every square meter of eelgrass impacted. Introduced in 1991, the Southern California Eelgrass Mitigation Plan has been utilized by the National Marine Fisheries Service, U.S. Fish & Wildlife Service, California Department of Fish and Game, California Coastal Commission, Army Corps of Engineers and other resource and regulatory agencies. No comparable policy exists for other California regions, and the goal of the draft California Eelgrass Mitigation Policy is to have one comprehensive plan for the entire state. The draft mitigation policy has been published for public comment, and can be downloaded at swr.nmfs.noaa.gov/hcd/. The public comment period closes at 5 p.m., July 7.